Protects the face exposed areas. 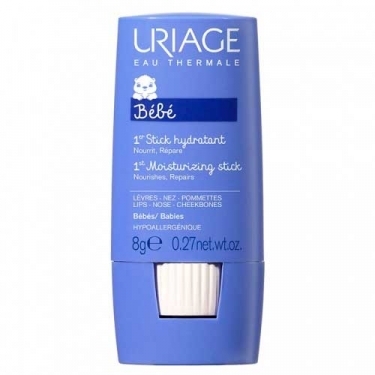 DESCRIPTION: Stick Hydratant Réparateur from Uriage is a restorative care for the face of your baby. Formulated with Shea Butter, Vitamin C, Vitamin E, Borage Oil and Licorice Extract, nourishes and moisturizes baby's skin while protects the face from free radicals. 100% of parents are satisfied, the repairer stick protects the skin from external aggressions and leaves a protective film on baby's skin. Without perfume. * Tested on 20 babies under pediatric control. Daily use for 21 days. Self-assessment questionnaire. Apply 2 times a day on the face on the weakest areas (nose, cheekbones, lips).